Background: CDAI is a composite index for quantifying disease activity in RA. It utilises 4 clinical parameters namely, swollen and tender joints out of 28 (the set designated for DAS28) and global assessment of the patient and assessor on a visual analogue scale. No laboratory parameter is needed. 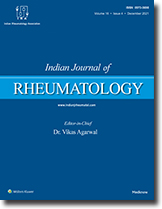 Objective: To determine cut-off values for CDAI (clinical disease activity index) in Indian patients with rheumatoid arthritis (RA) for classification into different grades of disease activity. Methods: CDAI and DAS28 (disease activity score on 28 joints) were measured at the first and again at the last clinic visit on 100 adult patients with RA seen over a period of 1½ years. Using recommended DAS28 values as a comparator for classifying patients into the following 4 categories of disease activity namely 'remission', 'low disease activity', 'moderate disease activity, and 'high disease activity', the corresponding CDAI cut-off values were derived statistically. Results: Among Indian patients CDAI cut-off values for the classification of patients into 4 categories of disease activity were: remission ≤ 2.2, low disease activity > 2.2 to ≤ 5, moderate disease activity > 5 to ≤ 21 and high disease activity > 21. Conclusions: CDAI, a simple tool that is based on clinical parameters alone, was applied to the Indian patients with RA. The cut-off values derived in this study by a standardised assessment methodology could be useful in routine monitoring and therapeutic decisions in RA. Objective: This study aims at comparing high frequency ultr1asound (US) in the diagnosis of enthesopathy in patients with seronegative spondyloarthropathy (SSA) as compared to controls, to ascertain whether US adds objectivity to the diagnosis of enthesopathy. Methods: Consecutive patients who were diagnosed as having SSA were studied by high frequency US for the presence of changes of enthesopathy, namely thickening, abnormal echogenicity, irregularity, nodules, fluid collection, calcification, bony changes, rupture and bursa. Results: There were 73 cases and 34 controls in the study. Each individual change studied had high specificity and positive predictive value (PPV) in individual subtypes of SSA and the group as a whole. Among the changes echogenicity, irregularity and nodules showed statistically significant values (0.03, 0.015, 0.01) with specificity of 94.1%, 94.1% and 94.1%; PPV of 88.9%, 90.5% and 90.5% and likelihood ratio of 3.73, 4.42 and 4.66. All changes were found diagnostically important except bursa, which was common in cases and controls. Conclusions: US examination of entheses offers morphological information, which is unobtainable by clinical and plain X-ray examination, in the detection of enthesopathy in patients with SSA. In the third part of this four part review, we already have the stop sign and our three road signs pointing to secondary vasculitides, pseudovasculitides and primary vasculitides behind our back and we have also passed the first mile- stone, where "patient history and physical examination" was written with large black block letters. GP can get far with simple blood, urine and stool tests and routine X-rays (second milestone). Almost all vasculitides of clinical signifi- cance are characterized by increased ESR and raised C-reactive protein levels and often also by normocytic nor- mochromic anaemia, leucocytosis, eosinophilia and thrombocytosis. Urine test may demonstrate haematuria, proteinuria and cylindruria, X-ray of the paranasal cavities chronic sinusitis and chest X-ray shadowing and cavita- tions. Serological tests may disclose an unexpected hepatitis B or C or perhaps ANCA. The possibilities described form such a cornucopia that we need to have our patient history and physical examination right for the right picks. This is even more pertinent when we take to the sledgehammer in the referral centres (third milestone) and deal with the histopathology of vasculitides as hopefully seen in biopsies rather than autopsies or perform invasive radiology. High resolution colour Doppler ultrasound offers a useful, non-invasive method for the diagnosis and guidance of an eventual biopsy site in temporal arteritis and is helpful in the diagnosis of Takayasu's arteritis and Kawasaki disease. Aortic arch, mesenteric, splanchnic or renal angiographies, MRI, contrast-enhanced CT, gadolinium-enhanced mag- netic resonance angiography and positron emission tomography are dealt with but require the right patient and the right "doctor decision maker" not to cause harm and to avoid waste of scant resources. The revised criteria for the antiphospholipid syndrome was published in 2006. Major changes from the 1999 criteria are an increase in the time between the two laboratory studies required for diagnosis from 6 to 12 weeks, the acceptance of antibody to β2 glycoprotein I as a criterion, the exclusion of older age persons, and the acknowledgment of several associated "non-criteria" features such as livedo reticularis, heart valve disease, thrombocytopenia, renal thrombotic microangiopathy, neurological manifestations, non-criteria antibodies (IgA aCL, IgA anti-β2 glycoprotein I) and some research laboratory-identified antibodies (antiphosphatidylserine antibodies, antiphosphatidylethanolamine antibodies, antibodies against prothrombin alone and antibodies to the phosphatidylserine-prothrombin complex). New concepts of pathogenesis now implicate complement activation and participation of the innate immune system upstream to thrombosis. Newer studies also suggest TNFα as a critical effector in aPL-antibody induced pregnancy loss, making anti-TNFα therapies a viable future option for this condition. Warfarin remains the treatment of choice for patients who have suffered thrombosis, but antiplatelet agents and heparin are options. Target INR is 2.0-3.0. The other drugs which are used in resistant cases or as experimental drugs are: rituximab, hydroxychloroquine, thrombin inhibitors and statins. Treatment is potentially life-long, though options for withdrawal of treatment are under investigation. Pulmonary hypertension (PH) is common to a large number of cardiac, pulmonary, and connective tissue diseases (CTDs). Chronic thromboembolism is a well-recognized cause. A substantial proportion of cases are idiopathic. Miscellaneous categories include familial pulmonary hypertension, HIV disease related PH and portal hypertension related PH. CTD-related PH may be secondary to interstitial lung disease or isolated, i.e. "classical" (in absence of pulmonary fibrosis). The latter is more commonly associated with the CREST Syndrome and MCTD. CTD-related isolated PH and idiopathic PH (IPH) are similar in their clinical presentation, histopathology and response to treat- ment. Early in CTD, the signs and symptoms of PH are subtle and non-specific and easily overlooked. There are now many guidelines for proper evaluation and treatment of idiopathic PH, which apply equally well to CTD-related PH. Doppler echocardiogram is an excellent screening tool to evaluate early PH. Rheumatologists and cardiologists should insist on the right-sided cardiac catheterization in these patients to help stage the disease and guide therapy. Until recently, clinicians were able to offer patients only symptomatic therapy but now there are several specific and effective therapies like prostacyclins, endothelin-receptor antagonists and phosphodiesterase inhibitors.